Alvexo is a relatively new online broker based in Limassol, Cyprus that is owned by VPR Safe Financial Group Limited and regulated by CySEC. It was founded in 2014 by a group of tech-savvy professionals and financial market veterans to provide comprehensive investment and trading services to help traders succeed. A screenshot of the broker’s official home page at www.alvexo.com appears below. Alvexo only accepts non-U.S. customers at this time. Alvexo offers clients its own proprietary multi asset web-based trading platform called WebTrader. This allows a trader the possibility of trading currency pairs, commodities, indices and stocks from a single trading platform. Some account types even offer an execution service in cryptocurrencies and CFDs. The minimum deposit amount for opening a live trading account at Alvexo is a rather high $500, and accounts can be funded through major credit cards, debit cards, some e-wallet services and bank wire transfers. The maximum leverage ratio available on trading accounts is only 1:30. Since Alvexo operates as an STP NDD broker with an ECN option, dealing spreads are typically very competitive, and so the broker charges volume-based commissions on most live account types. A free demo trading account funded with $50,000 of virtual money can also be opened to practice trading and try out the broker’s web-based trading platform and execution service. Several options exist for funding an account. Credit card transfers from Visa, MasterCard and American Express. Wire transfers from banks or other financial institutions. Most deposits are credited immediately to trading accounts, but wire transfers can take up to four days. Withdrawals to credit cards cannot exceed the amount deposited via that method. Any balance needs to be transferred via wire transfer to a bank. Alvexo offers clients a decent web-based proprietary multi-asset trading platform called WebTrader, which runs in virtually any up to date web browser. Traders can also use the broker’s mobile app that runs on Android or Apple iOS operating systems to trade and manage positions. Even better news is that the broker fully supports the highly popular MetaTrader 4 trading platform. In addition to the usual charting, trading and position management functions, this free trading software from Metaquotes offers third party automated trading solutions and custom indicators, as well as custom programming options. The screenshot below shows Alvexo’s WebTrader platform that includes technical analysis, trade execution and position management functions. Alvexo offers its customers telephone support in multiple languages and locally in eight countries. The broker also makes email support available for compliance, finance, marketing and support queries, and faxes can be sent to its UK, Swiss and Cyprus offices. Educational – Albexo offers a forex Trading Academy where new traders can pick up the forex trading basics and learn trading strategies by viewing tutorial videos. More experienced traders can benefit from the section on developing a trade plan, doing market research and analysis, and refining trading strategies with more sophisticated methods. Regulatory Compliance – The broker is licensed by CySEC under number 236/14, and its parent VPR Safe Financial Group Limited is a Cyprus Investment Firm operating under CySEC oversight with registration number HE322134. Alvexo may be a relative newcomer in the online broking field, but they offer the notable pricing and transparency advantages of the STP NDD broker model with an ECN account option. Those benefits are balanced by a volume based commission charged on all live accounts — except for the Classic account — and which could present an issue for high volume traders. 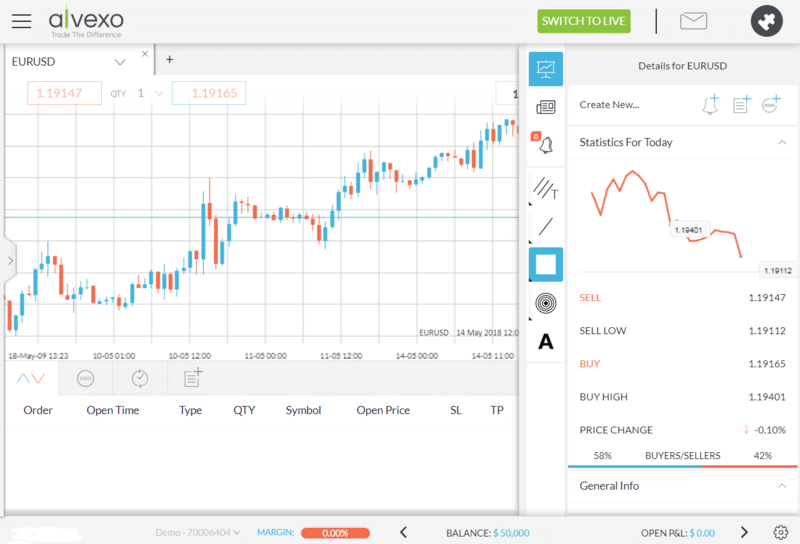 Also, Alvexo offers support for a range of trading platforms that includes their own propriety web based platform WebTrader, as well as MetaTrader 4 and a fully functional mobile app. The broker also gives traders access to much more than just the forex market, with over 140 tradable assets offered, and the company’s CySEC regulation means client funds are kept segregated under the EU’s MiFID. Furthermore, their multi-lingual customer service department and Trader Academy provides the support newer traders will require. If a trader can afford the rather high initial deposit of $500 and are willing to settle for the relatively low maximum leverage of 300 to 1, then this broker seems quite suitable for both novice and experienced trader alike.